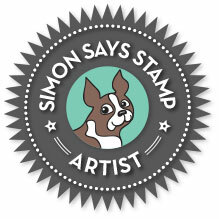 I'm in Haven: Simon Says Stamp Hey Love Blog Hop! 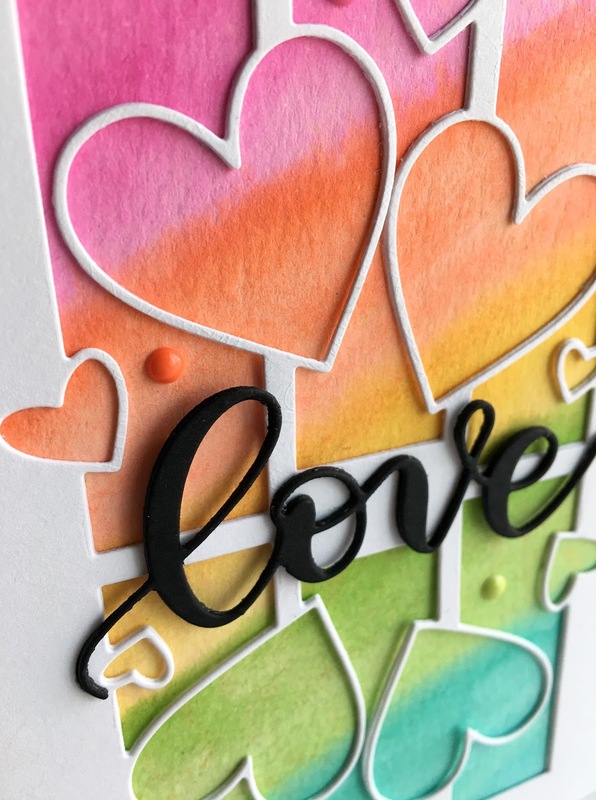 Simon Says Stamp recently came out with a new release, HEY LOVE, that is FILLED with lots of amazing and beautiful new stamps and dies, celebrating love... I am so in LOVE with this release!!! Today, Simon is celebrating this release with a fun blog hop...just in time for the season of love, Valentine's Day, but HEY...LOVE is for EVERY DAY, right???!!! Hope you will join me and the other wonderful artists in this hop, finding some "lovely" inspiration as you hop along with us:):)! I made a couple cards that celebrate love in everyday ways! OK...SO...MUCH...FUN!!! Love is truly for every day...for every occasion!! Lisa Addesa <you are HERE! Beautiful cards - I especially love the filled hearts card - gorgeous! Oh I love that rainbow card! It is so vibrant and fun, and it really helps the "love" pop! Great work! Love these designs. So pretty. Really love how your cards are simply but beautiful, love the background in the first one. love the way you use the dies on the cards and the colors. Love the multi-colored look. These are beautiful! I love these cards and these dies!!!! Oh my. Both cards are stunning. absolutely love that watercolored background! may have to try that ! I love the way you used the die as a mirror image. Brilliant. Oh my word Lisa!!! SO pretty!! I really like both of these cards, but the die cut heart card truly speaks to me. LOVE IT! Seriously!!!!! Love these..especially the Water Colored background card. Oh wow! Stunning Valentine's cards!!! Love them!!! Great idea with cutting the die twice! Brilliant! Love your take on valentine cards. So colorful and fun! So pretty and unique. Beautiful. Cut twice! Great idea and I love how you used cream, red and pink together so elegant yet whimsical! Both of these cards are terrific Valentines. I love that gorgeous watercolor panel on the first card and using the die upside down is so clever. Beautiful cards! I love the bright watercolors on the first card and your use of paint chips on the second. I'd love a little more detail on how you made that first card. It is so different and just awesome! Love the die cuts you made on these cards with the added color! Just love them! Thanks for sharing!! Fantastic ideas and what great products from SSS in this Hey Love collection. What a great idea, paint chips. They are free too. Love these cards, great way to show versatility of mixing and matching stamps. Great ideas and great cards! It's a win-win! TFS! I love both your cards! Gorgeous! Wow!! Fab cards!! The dies in this release are awesome!! These cards are amazing! What a great idea to use one of them end to end! I have so many ideas right now, what a great Hop! Love, love your cards. They are so pretty. Love your heart card today.... now I want to go watercolor something! Shoot I have to clean house today! Beautiful Cards!!! I love them!!! Great release. Your cards are stunning. Both your cards are beautiful, using paint chips in the clipping hearts die is a great idea! really like that you used that heart die for a bday card! Two beautiful card creations Lisa! I love rainbow peek-a-boo effect of the first one! Gorgeous cards! Awesome cards! 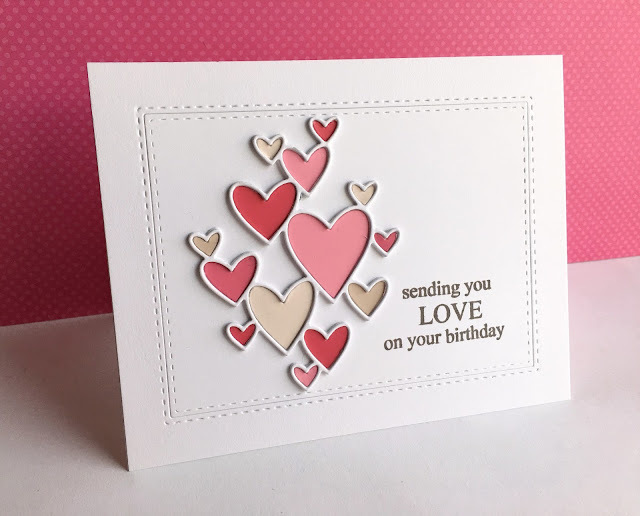 I really like the simplicity of your second card and the addition of the heart colors is perfect. Love the idea of filling the hearts with different colors. 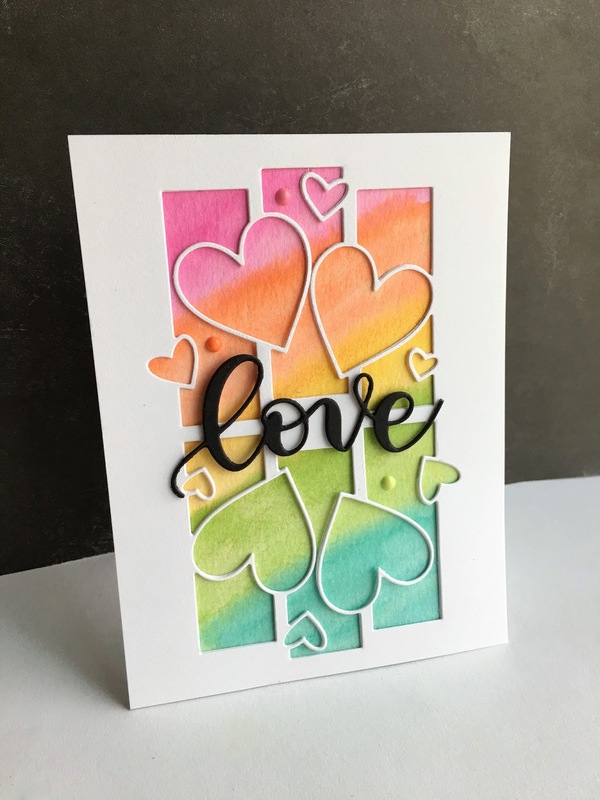 And the rainbow background is gorgeous with the simple white die cut. Thank you! Love these! Such sweet cards and love the watercolor background! Beautiful cards. Must have the SSS clipping heart die. Fabulous! Lovin all the great products and your beautiful cards! Very beautiful and simple cards. Really pretty! Love the die cutting you did! That heart die cut is one of my favorites! I love the rainbow background of your first card, and in the inlay diecuts of your second card. Beautiful! Rainbows and ombres - I just love your colors and inspiration. Love the way you used the dies! Your cards are fantastic. You have provided great inspiration for me. Thanks for sharing. Pretty use of the heart dies for wonderful unique looks. Wow! Your cards just pop! They are beautiful. Thank you for the inspiration. Awesome cards!! Love how you flipped the die!! Super Beautiful!! Beautiful cards. I am loving all the new dies! Great Job!! Your second card really is GORGEOUS, but both are wonderful!!! Gonna have to come back & see this post again--absolutely love the look of these cards! Pinning them both! Great cards! Love the colors of the first one and the layers. The second one is so pretty with the added layers of the hearts! More stunning work on your part! Thanks. Love the colors on the first card! wow, I love these designs! very nice. so clever to put the die upside down to make a mirror image. Love your cards, the second is my favorite! I like the clean and simple look of it and the pop of colors in the hearts. Loving your ideas and I'm gonna have to duplicate! These cards are absolutely gorgeous! I really like how you turned the die around in the rainbow-colored one. Great way to use the dies. Awesome cards. I think I need to get these dies! Oh my! The technique you used turning the die upside down is clever...thanks for sharing! I have to say that the heart cutout card is so fresh and clean...love it! Love how you did the hearts on the second card and the shade variation. Beautiful! Love the new Hearts Alive die. It will be on my "want" list! Love, love, love your designs! I pin almost everything you do!! Love the dimension on both of them. Love how clean and simple your cards are, yet the details make them interesting! Thanks for sharing! Wow --one of my favorites so far! Both of these cards look like they would be so fun to create! you always make such pretty CAS cards Lisa! Beau Cards my favorite is the second. Just stunning. Love the way these look. Especially love the mirror image of that die. Cool!!!! Cute cards. I love the two directions that you used with the first die. With each of them I feel the love! These are gorgeous! Simple, elegant, yet look like fun to make! Beautiful heart cards. I like the background on the first one. Wonderful use of the Hearts Alive die! And I like your second card, too. Paint chips sure are a useful part of my stash, too. Love your cards. Fabulous work! I love the inlayed hearts! Gorgeous!! Can't wait to try this!! Beautiful cards! Love how you backed the panel die to slightly elevate it above the background! Very creative! Both cards are so pretty - I love both of those dies!!! You sure have a knack for using dies. Great cards. The second card with the filled hearts was my fav. Both cards are winners! I really like the new dies...making choices is the difficult part!! I love both these cards! Will have to try the water colour rainbow technique!! Great cards, different colors of hearts. The heart dies are so fun! I especially like the birthday card. Love these cards, must have both of those dies. You have showcased these dies and stamps so beautifully. I especially love the ombré one. Just when I thought I had enough heart dies, you and SSS proved me wrong! Gorgeous! Fabulous cards, love the heart die with the paint chip colors underneath, great idea! These are fantastic! I love how you did the first one! Love the clipping hearts die and your colors with it. Wonderful. Such a great release. I can't wait to see what everyone makes!! These are beautiful valentines cards. Love them both. Lot of inspiration here! House work may have to wait a while! Great way to get a whole different look from a die (the rainbow card). You are so creative, love all the cards! Both of your cards are fresh and lovely! The first one is so unique and creative!! Need these dies in my stash!! So fun! TFS! Beautiful cards. Thanks for the ideas! Love everything about your cards. Beautiful! I love how you used that hearts alive die in the first card. The water color background is so pretty. Thanks for sharing. Great job on your cards. I now have another die to add to my wish list!! Your cards are so bright, colorful and cheerful! Such cute cards. Good use of the stamps and dies. Love the pretty colors you have used. And the new dies are simply awesome. This is a really great release and I am thoroughly enjoying the eye candy! Gorgeous work! you need a youtube channel if you don't already have one. Love that die used on your second card! I might need that one! For some reason I want some ice cream after seeing your cards. They are so clean and neat. Great job! Very nice, like then both. Thanks for sharing. Your idea of using different colors of paint chips really makes this heart diecut come to life ... thanks for sharing with us! Your Hearts Alive card is stunning with those die cuts and ink blending. Your second card with the colorful paint chips is very cleverly done. Love 'em both, Lisa! I would never have thought to reverse the die and cut back to back. It is very effective. Thanks! Wonderful cards, Lisa! Thanks for all the inspiration for the gorgeous dies from this release! Great use of the dies!! So lovely! I love how you used the die to make a mirror of each other! Wow, and now I cannot resist to purchase this die. Lovely use of the dies! Very pretty! Love these cards. Such adorable designs. Thank you! Adorable cards! Loving the new heart dies. Lots of color! Love it! Both cards are beautiful! Love the colours and the clean lines! Beautiful cards. I love both of those heart dies. these are both so sweet & pretty- love your fabulous clean designs! OH MY those are Fabulous looking!!! I think I am beginning to sound like a broken record because everyone's creations have been so Fabulous looking!!!! Love how you used these dies on both cards! The added colours make them even more eye catching! Both cards are so wonderful! Love the colors you used and the way you used the die cuts. So pretty!! Both cards are beautiful, and love their CAS design. Your birthday card (2nd) is my favorite, the delicate frame you created for the colored hearts has a simple elegance. Love your cards, they are beautiful. I love colors!! Fabulous cards -- love the black with the rainbow, and the inlaid die on the 2nd. Both of your cards are just lovely! Wow, just wow! I love these dies and your great ideas. So dramatic is the watercolor... love it! Both cards are as cute as can be. Lovely colors. Love the way you used that heart window die!! Love the clipping heart with all the shades of pink! Great cards! 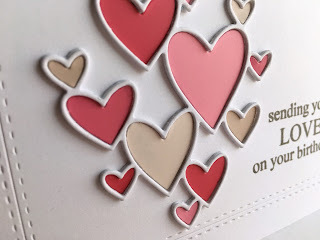 Love the heart window die and how you used it! Love these cards (you really rocked those fabulous dies!) Simply beautiful. These cards are really lovely. Love your cards - especially the heart window! love how you used the heart window die twice on the card. great thinking!